Use of thugs ‘chandiyas’ or ‘marayas’ by those in authority has its roots in the colonial period. Later, Sinhalese politicians adopted this method in village level politics spreading into urban locales. It is a method used to control public opinion and behaviour, more importantly to submerge alternative viewpoints and behaviour and divert the popular will in the direction of those in authority by using physical force, fear and the like. The only way to counter such acts of intimidation, thuggery, bullying and harassment is to organise those with alternative viewpoints into collectives or action-groups and resist while educating the public. This paper argues that perhaps it is time to set up a Nelum Balakaya (NB) to spread the message about the need for democratic freedoms, good governance and rule of law. Recent attacks on young artists near Kurunegala by political activists in blue attire as reported in the media reflect a deeper trend in Sri Lankan political scene with far greater implications for good governance (Yaha Palanaya) and its future. It is reported that those belonging to Nil Balakaya –an organisation headed by Namal Rajapakse who is an MP,(and also the son of the executive President of Sri Lanka) instigated these attacks though this has been denied by Nil Balakaya officials (Daily Mirror 31.12.2014). This is not an isolated incident and many such incidents of harassment, bullying and intimidation of political opponents by the ruling coalition have been reported in the media during the current election campaign showing a discernible pattern. Thus it is important to examine the roots of such acts in the Sri Lankan history, particularly in the Southern Sinhalese heartland, i.e. Hambantota district. Employment of thugs –marayan or chandi by those in authority goes back to the colonial times in Southern Sri Lanka. Oral history from villages in Walasmulla area in the Hambantota district reveals that Pattuwe Ralahamy of the Giruva Pattuva (West) used thugs when he travelled from Walasmulla area to remote hill villages in places like Kirama, Katuwana and Hingurakanda to collect taxes on behalf of the colonial administration. According to such historical narratives, Pattuwe Ralahamy and his coterie of supporters organised several bullock carts for this purpose and travelled to these villages with the assistance of thugs or ‘chandiyas’ who carried guns. As some villagers in the hills did not have money to pay taxes, chandiyas working for Pattuwe Ralahamy collected other materials such as cattle, chicken, grain, bananas, Jack fruit, treacle (pani), juggary (hakuru), goraka, pepper and other locally produced items. When villagers refused to hand over large quantities of these items, thugs used threats and intimidatory tactics to collect them by force. On the return journey, they guarded the bullock carts full of collected items from attacks by other bandits or thugs until they reached Walasmulla area safely. These thugs used ‘attack dogs’ also for this exercise. A villager near Walasmulla who is now 100 years old told this story. He is one very knowledgeable about the colonial practices in the area and the experiences of average villagers. He still has a reasonably good memory of those times, people, events and issues. However, such practices have to be understood in the social and economic context as well as the harsh environment prevailing in this area at the time. Though there were rules in the colonial rulebooks, the remoteness of the villages and the harsh environment allowed local officials in charge at the time to use whatever the tactics available to accomplish their goals on behalf of the highest authority of the land. In the fifties and sixties when I was growing up in a village called Ethpitiya near Walasmulla, I remember the way ‘chandiyas’ used to intimidate, bully and harass the average villager (farmer, shop keeper, cattle owner, labourer etc.). One of the valued assets villagers had was cattle – both milking cattle and buffaloes. They were used in ploughing, trashing paddy also. The popular Southern product Mee Kiri and Ela Kiri were produced by buffaloes and cows respectively. Thus the owners of cattle and buffaloes had social status in the villages. However, they had to move cattle and buffaloes from village to village when the area was under droughts to find grass or hay to feed them. Thus villagers in Ethpitiya and closeby areas like Horewela, Yahalmulla, Oluara, Madagamgoda took their cattle and buffaloes to far-flung areas like Ranna and Ambalantota. On these trips protecting cows and buffaloes from thieves and chandiyas required particular skills including a degree of bravery. Likewise, when they were stationed in Ethpitiya, Horewela, Yahalmulla etc. protecting them from thieves (harak horu) required a lot of imagination and foresight by the owner and his family members. In an environment where there was no electricity and the nights were dark, this task was made particularly difficult. Battery powered torches were also a rare commodity. If there were any intruders at night, the dogs start to bark at the shadows and it was incumbent on the cattle owner to get out of the house to search if there was any suspicious activity in the harak gala (place where cattle and buffaloes were kept at night). Often they would light a kolapuva (outer cases of coconut flower in dried form) and venture out of their thatched houses to inspect. I remember about one particular youngish thug from Bowala village with a name for stealing cattle. Villagers often talked about him as a possible suspect whenever they discovered a cow has gone missing. During the day, this chandiya would come drunk and pass through the village uttering filthy words against a few other local chandiyas and householders who owned cattle. There was also another person belonging to a respectable family in Walasmulla owning land in Bowala area who would walk through the village in the evenings half naked (edge of the sarong lifted up by hand half way through so that personal amenities of the person becomes visible to the public) uttering filth to frighten the villagers. Villagers ignored both though sometimes the youngsters who were keen for a fight would shout from a distance to provoke these drunken individuals. In time to come, in the 70s and after, use of thugs for protecting political stages –while being built and after –became a necessity. Politicians and their local supporters used unemployed thugs or chandiyas for this purpose by paying them a few rupees, feeding them and providing alcohol (Arakku or Kasippu). This is not unusual as the Sinhalese are used to employ someone to do various tasks in the household, gardens, offices, paddy fields, etc. Locals –both males and females-from respectable families would even go out with one or more attendants –not necessarily thugs- to carry heavy stuff. In the past, such people even carried umbrellas or other personal items for the respectables. During the colonial past, when there were no modern umbrellas, locally made head covers from plant leaves of various kind were carried to protect from the strong sun or rain. What is important to note though is the fact that some of these people who accompanied respectables in the area or helped them around the houses, gardens, work sites or when shopping acquired some status by the mere fact of such association with the powerful and respectable families. These attendants then used this association with the powerful and respectable families and individuals to command some power and respect for themselves from the rest of the villagers in circumstances where their bosses were not present. Obviously, some of these people would engage in the acts of thuggery, intimidation, bullying etc. as an extension of the real or symbolic power they acquired by their association with the powerful and respectable families. Once these acts came to the knowledge of respectable and powerful families, some would admire them. Others would castigate the persons who behaved improperly. This depended very much on the ethical values acquired or not acquired by the members of respectable and powerful families. Alcoholism was a key factor that functioned against safeguarding such ethical values. When members of respectable and powerful families and their assistants started to drink together social norms separating the two categories of people was broken down. An interesting aspect of this practice of using helpers and attendants among whom some were those considered as chandiyas was the fact that the more one had such obedient people the more power the members of respectable families would get. The employment of such people carried with it ‘a sublime message’ to the rest of the community, ie. know who I am or we are! Furthermore, it sent a message to the rest of the village community to toe the line, if not the consequences would be harsh. One such consequence was the stealing of cattle by using chandiyas or attacks on person. Arson was another tactic used. Physical Violence following small scale bullying, harassment, verbal abuse and intimidation against person and property as well as crimes resulting from such acts was a notable phenomenon in the South during the colonial period and its aftermath. Former Commissioner of prisons, late Mr. J.P.Delgoda completed his Masters thesis on Crimes in Southern Ceylon at Illinois University, USA. Criminologist C.H.S. Jayewardene has also written about these aspects. One issue at the time attracting the attention of criminologists was the unusually high rate of grave crimes such as homicide committed by individuals in the area. What is significant today is the ‘nationalisation’ of these practices to the whole country involving the political field and sidelining the law enforcement agencies. Acts of bullying, intimidation and harassment by young and middle aged political activists against another group of young people who were performing and broadcasting an alternative message bear the hallmarks of above-mentioned Southern colonial and postcolonial practices. But what is more alarming is the employment of such practices as part of a broader political culture that has spread throughout the country with the granting of political power, resources and official sanctions to elected MPs in the provincial Councils? Whether the Provincial Councils have paved the way for nationalising a local practice is a reasonable question to ask? Young artists, like anyone else, should have the freedom to disseminate an alternative view about the situation in the country, challenges people face, their issues and dilemmas wherever they wish to do so without any intimidation, bullying and harassment from chandiyas turned politicians –whether they belong to Nil Balakaya or not. They should not be prevented from doing so because of a cancer that has developed in the political system and culture with drunkenness of power, prestige, resources and a desire to monopolise power. These young people are very brave people who have a social and political consciousness with a critical bent–a quality that is different from those qualities that political chanidyas bring to the fore. It is a noble quality that needs to be spread throughout the country by way of another Balakaya not only during this election campaign but even after for good governance where rule of law, equality before the law, protection of human and civic rights etc. become key planks of a functioning democracy which is a contrast to a monarchical system of governance to be maintained by the public purse. All the strength to those young artists and the artistic community in general in their struggle for social justice, equality, freedom of expression and now even the right to life! Fascinating — the historical roots. Thuggerism is raising its head again supported by politicians. This may not be to the liking of MR as he would have preferred to have a successful winning campaign without these unpopular acts. and his campaign managers should have known and advised the party workers accordingly tl take MR to the winning side. I would not blame the close associates for all the thuggery, intimidation, and the attacks on the opposition. You cannot be suggesting that the Rajapaksa’s especially the Sec. of Defense, have no knowledge, nor control, over the crimes. If they don’t then they are incompetent and unable to control their mobs, or they are complicit in these crimes, by doing nothing, saying nothing, nor showing outrage for the crimes. Sri Lankans are not that naive. 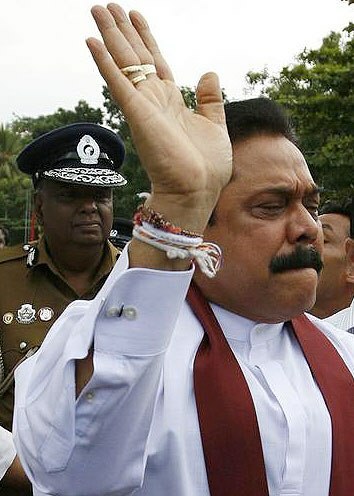 The Rajapaksa’s all 200plus of them, are fully involved in the campaign, and doing their best to keep their powers. It seems all the thuggery and intimidation is masterminded at the MoD by a panel of retired and active list generals and admirals on behalf of the President. Least said is the best to avoid incriminating themselves; no need to gather intelligence because what is going to happen is already scripted at MoD. Current setup by MS looks perfact for SL democracy. Their to be four divisions within the system. The judiciary which will function as before without any political interference. I think the 43rd Chief Justice . Mrs S Bandaranyaka should nbe reinstated. Then the Executive power which is currently control by the President. There will be changes so that it doesn’t affect or over ride the parliamentary system. Third will be legislative. This will work with law malkers the parliament and judiciary. The fourth will be Good Governance. Oversee what’s happening in public office. These are the main view points that I will vote for Maithree in the upcoming polls. 2. Currently judiciary system is fully dead in our mother land. Need to ensure justice and law prevail in future. 3. Currently every where corruption, bribes and malpractices. To eliminate corruption and corrupted politicians…. 4. Current politics is built upon racial political views. To eliminate racial mind set from people…. 5. To strengthen economy and provide a healthy and peaceful environment to live…. I warmly welcome all…. to share their own thoughts. Winston Churchill who lead the second wold war to victory, later got defeated in domestic politics. His defeat became a blessing in disguise to England specially to all the colonies. No body is indispensable, always there is better replacement. Our media is rigged. Our police is corrupt, our money is being robbed from us, our journalists are being threatened, our artistes are being beaten, our minorities are being silenced, our justice system is a joke, our constitution is an embarrassment and right now , there are lots and lots of people getting assaulted and intimidated for exercising their right to vote.